and the annual Festspillene i Bergen (Bergen International Festival). In addition, Grieghallen is a fully developed course and conference centre right in the heart of the city. Grieghallen is Bergen’s cultural grand hall and today is home to the Bergen National Opera, which produces operas to a high international standard; the Bergen Philharmonic Orchestra, one of the oldest orchestras in the world; and the BIT20 Ensemble, one of Nordic region’s leading contemporary music ensembles. When Grieghallen was completed in 1978, it replaced Konsertpaleet as the Bergen Philharmonic Orchestra’s concert hall and the International Festival’s main arena. In 1996, Grieghallen could also present itself as a modern conference centre, and today it has meeting venues that total 8,000 square metres. The competition to design Grieghallen was won by a Danish architect, Knud Munk. He moulded the building to fit the available plot’s shape and introduced a use of materials that aroused strong reactions at the time. The use of materials such as concrete, glass and steel are an architectural feature of Grieghallen, and create a modern, flexible and minimalistic feeling. In his work with Grieghallen, Knud Munk was inspired by the architects Mies van der Rohe and Arne Jacobsen, and the brutalist concrete architecture from Japan influenced the stage tower’s design. Grieghallen’s adaptability makes it an arena for all types of cultural events, from ballet, opera and symphonic music to pop concerts, piano music and marching bands. Grieghallen is world-famous for its fantastic acoustics, and with its high standards of facilities and technical solutions, Grieghallen can offer the best on the market when it comes to hosting courses, conventions, conferences, congresses, concerts and other cultural events. If full advantage is taken of both concert and conference venues, Grieghallen accommodates approximately 7,500 people in total. Through the years, Grieghallen has been the arena for multiple major concerts and events. In 1986, Grieghallen was selected as the venue for the Eurovision Song Contest when Bergen was the host city. This was the first Eurovision Song Concert to be held in Norway, after Bobbysocks! had won with “La det swinge” the year before. 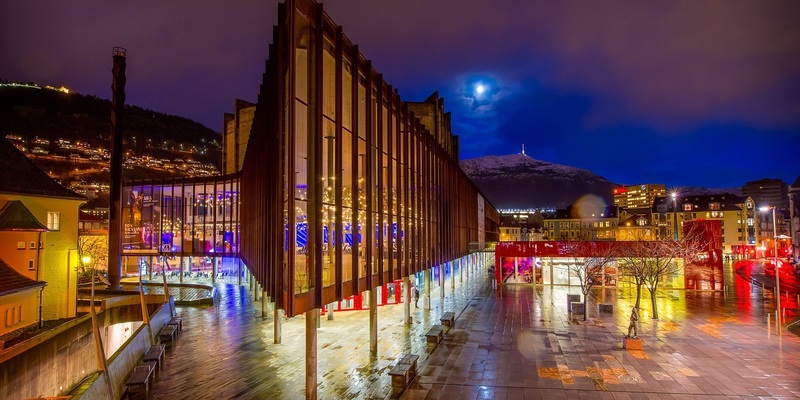 Grieghallen has also hosted big names such as Bill Clinton, Chuck Berry, Jerry Lee Lewis, Neil Young, Crosby, Stills & Nash and Miles Davis, as well as more local artists such as Dizzie Tunes, Sissel Kyrkjebø and Kurt Nilsen. In 1985, Grieghallen’s stage was frozen over and the public got to experience ice dance from the British figure skater John Curry, accompanied by a symphony orchestra in the orchestra pit.